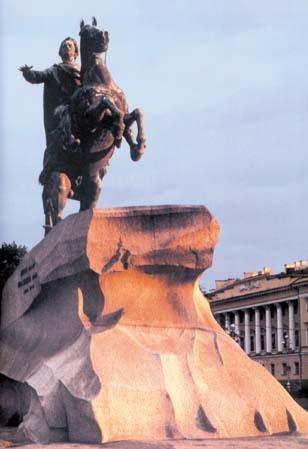 St. Petersburg has played an exceptional role in the life of Russia. It is the second largest city in our country. St. Petersburg is the most northern capital in the world. It is on the latitude as Greenland, Alaska an Chukotka. This explains the white nights which are most clearly visible between 11 June and 2 July. The city is rather young. It was founded less than 300 years ago. The founder of St. Petersburg is Peter the Great, who laid the first stone of the Peter and Paul Fortress in 1703 on Hare island, thus starting a new city. In 1712 it became the capital of Russia, the centre of its political and cultural life. St. Petersburg is one the greatest and most beautiful cities in the world. Its historical and cultural importance is as big as that of Paris, London or Rome. “Northern Palmira”, “Northern Venice” attracts thousands of tourists from all over the world. The Palace Square is one of the most beautiful architectural ensembles in the world. The square is dominated by the Winter Palace, the former residence of tzars, designed by Rastrelli in 1754�1762. 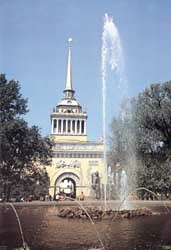 In the centre of the square there is the Alexander Pillar, the monument to the victory of Russian people in the Patriotic war (1812). The ensemble of the square includes the monumental Admiralty building, designed by Peter the First in 1704. Like the Red Square in Moscow, the Palace square has witnessed the most important events of Russian history. The Hermitage is Russia�s largest museum. There are a few museums in the world which can compare with it in its value, richness and variety of its exhibits. Its collection includes over 2,7 mln items of both European and Russian culture. It is housed in 125 halls. The Peter and Paul Fortress is located on Hare Island, on the right bank of the Neva river. It was designed by Peter the First. It has never been used as a fortress and its bastions were turned into political cells. Nowadays it is a museum of architecture and history. 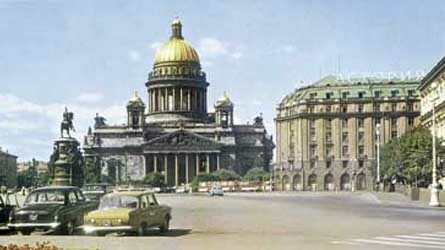 The Peter and Paul Cathedral was the burial-vault of Russian emperors since Peter the Great. Today the Russian museum contains more than 300,000 paintings by Russian artists starting from the 10th century. The St. Isaac�s Cathedral is one of the most grandiose cathedral in the word. It can hold 14,000 people. A marvellous view of the city one can have from its observation platform. The Smolny architectural ensemble is a proud of the city. It took shape in the 18�19th cent. The oldest part of it is Smolny Convent (1764) with magnificent 85 m high Cathedral. In the 19th cent. The Smolny Institute, the school for girls of noble origin, was built close to the convent. One of the most beautiful and highest buildings with a cupola 101.5 meters high. It was built during 40 years (1818�1858) to the design of French architect August Monferan in Russian classical style. It is interesting not only for its architectural style and construction technology but also for its interior decorated with 150 paintings, 62 mosaics, sculptures of Russian and Italian sculptors. Peter and Paul Fortress. The oldest monument of history and architecture in St. Petersburg.The construction of it started in 1703. It was built as a fortification during the Russian-Swedish war. But it was never used as a fortress and its bastions were turned into political cells. There a son of Peter the Great, prince Alexei, a famous pretender to the throne, princess Karakhakova, writer Radishchev, Decembrists, narodniks and revolutionaries were held prisoners. The Peter and Paul Cathedral designed by Tresini was the burial-vault of Russian emperois since 1725. Yusupov Palace. The residence of an old and noble Russian family — the Yusupovs. It was also the site where Rasputin was murdered. Gala and residential rooms of the palace are open to visitors. Concerts of classical and folk music are held there. Petrodvorets (Peterhoff) is one of the most beautiful towns in the suburbs of St. Petersburg. Before the October Revolution it was the imperial summer residence. It is situated on the Gulf of Finland, about 30 km from the city. At the beginning of the 18th century palaces were built and parks with fountains were laid under the order of Peter the Great. The complex includes 7 parks, 20 palaces and palaces and pavilions, fascinating fountains, among there is the highest in the world � the Great Cascade fountain. 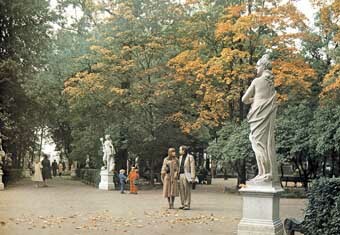 Pushkin is situated 25 km south of St. Petersburg. Since the early 18th century until 1917 it has been the official royal residence — Tsarskoye Selo. Catherine�s Palace, constructed in the 18th century, is noted for its beauty, majesty, interior decoration and the famous Jade Room. Pavlovsk (32 km from St. Petersburg) was established in 1777. 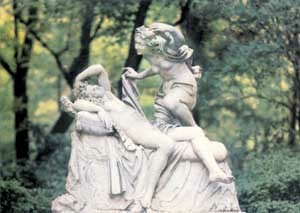 It was a present from Catherine II to her son, Paul I. The park of Pavlovsk is considered one of the most attractive royal parks in Europe. 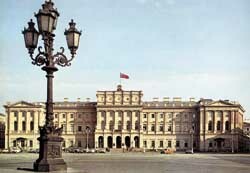 The palace was totally renovated after its destruction in the Second World War. Lomonosov (Oranienbaum). In 1710, the governor of St. Petersburg and Peter’s favorite Alexander Menshikov ordered to construct a grand summer residence not far from Peterhoff (10 km) on the Gulf of Finland. Visitors can see residential and household rooms of the time of Peter III in the China Palace built by architect Rinaldi. In the Katalnaya Gorka pavilion, exhibition are held, the most interesting of them is that of porcelain.